Jonathan Rea extended his lead at the top of the World Championships series to 26 points by winning race one at Aragon and taking second in race two. Welshman Chaz Davies secured victory in the second race on a Ducati, having been runner-up to Rea in the opener. Northern Irishman Rea, 28, clinched his fourth success of the season by winning by 0.051 seconds on his Kawasaki after a thrilling end to the first event. England's Leon Haslam was third and fourth and is second in the standings. On the brakes into the final corner of race one, Davies dived into the lead but Rea turned tighter and got on the power fractionally earlier, giving him the smallest advantage which he carried over the line for another maximum points score. Third-place finisher Sykes led from the start until there were eight laps remaining, at which point Rea dived under the Yorkshireman into turn four, where he had earlier passed Davies for second place. Leon Haslam finished in fourth after a race-long scrap with team-mate Jordi Torres and Ducati replacement rider Xavi Fores. Davies enjoyed an advantage of 3.19 seconds over Rea at the end of race two to seal his first World Superbike win since 2013. Haslam completed the podium positions, but Sykes crashed out unhurt with 14 of the 18 laps remaining. Rea, based in the Isle of Man, won one race at the opening round at Phillip Island, Australia, in February and followed that up with a double success at Thailand in March. He now has 19 World Superbike career wins and is looking forward to potentially extending that tally at Assen next weekend. "A first and a second are the best results I've ever had at Aragon and it's good to get some more good results and pick up plenty of points. 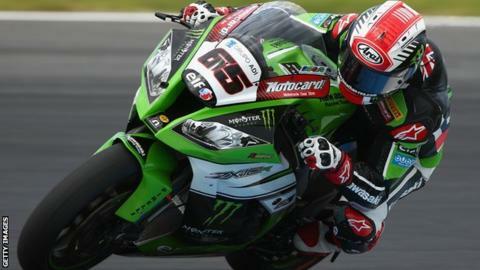 Assen is a circuit I really love so bring it on," said Rea.